The kitchen area has a microwave, hob and oven, toaster, George Forman grill, large fridge freezer and washing machine. There is plenty of crockery, glassware and cutlery for 4 people. The bedroom has a double bed with plenty of wardrobe and drawer space. It is situated at the rear of the apartment and has a pleasant view where you can view some spectacular sun sets. The apartment has ceiling fans in the lounge and bedroom for the summer months, although, we find the apartment to be very cool and don’t experience problems sleeping. There are two portable heaters for the winter months. Torrevieja is situated between 2 large and beautiful salt lakes “Salinas de Torrevieja”. The combination of salt and temperature combine to make a healthy micro-climate recommended by doctors for various ailments. 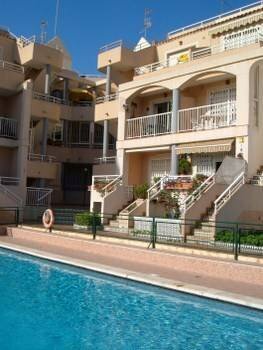 The climate in Torrevieja makes it an ideal location for year round holidays. The promenade provides an abundance of restaurants for all tastes. There are also shops a funfair and a craft market open daily, all within walking distance of the apartment. The promenade is a must in the evening for a leisurely stroll a meal and a drink (or ice-cream in one of the many ice-cream bars which are very popular with our Spanish friends) also a bit of people watching. Playa de Los Locos is a very busy beach in the summer and is popular with locals and holiday makers alike. If you prefer peace and quiet, you will always be able to find a little spot or cove along the coast where you can read or just relax. If you want action, a full range of water sports can be found at the Marina Internacional de Torrevieja. Villamartin golf club, Royal Campoamor golf club and Las Ramblas golf club are a short drive away. Also in Torrevieja you will find the Habenaras shopping centre. There is a cinema and bowling complex and a large water park. The apartment is situated very central for all amenities therefore a car is not essential. However, if you want to explore further a field, a car is recommended. Alicante (45km) a great place to eat and explore, and a lovely marina. Benidorm (75km) where you can also find “Terra Mitica” Spain’s largest theme park. There are also lots of beautiful villages to visit and explore. If you don’t like to drive, there is a bus stop out side the apartment which takes you along the coast to La Mata or into Torrevieja centre (the bus does not run from the apartment on a Friday because of the street market) The main bus station can be found in the marina area of Torrevieja. The appartment is situated overlooking the pool and park.